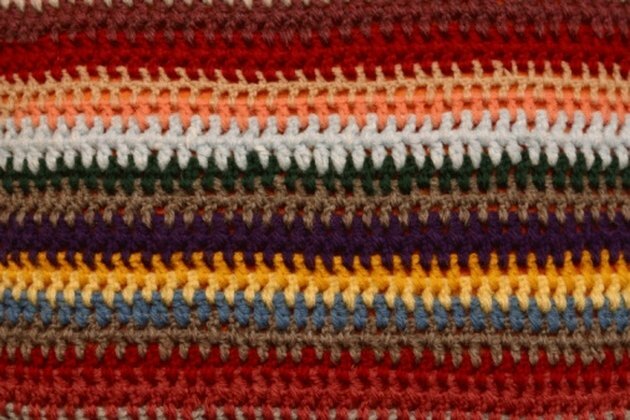 A rag rug is a useful item to have around the house. Put it in a room and it becomes a soft place to rest, a way to wipe your feet or a conversation piece. If you can crochet, making a rag rug will be a fast and engaging project. Use fabric scraps and remnants in place of yarn and crochet a heart-shaped rag rug to use in your home at Valentine's Day or any time of the year. Crochet a rag rug using long strips of old fabric instead of yarn. Cut your scraps of fabric, old T-shirts and other clothing items into strips approximately 1 inch wide with sharp scissors. Knot the strips together to make one long strand of fabric "yarn." Join your fabric to your crochet hook with a slip stitch. Make three chain stitches to start. Make a single crochet in the second chain from the hook and in each chain across for a total of two single crochet stitches in row one. Chain one and turn; make two single crochets in the first stitch, one single crochet in each stitch across the row and two single crochets in the last stitch. Repeat this for a total of nine rows in your project. You will have 18 stitches. Chain one and turn; make one single crochet in each stitch across. Repeat this for four more rows so you have a total of 14 rows in your project. Make the top right half of the heart shape. Chain one and turn; single crochet across the first nine stitches only. Chain one and turn; single crochet two together across the first two stitches, make one single crochet in each stitch across and single crochet two together over the last two stitches. Repeat this last row until you have three stitches left; fasten off with a slip stitch and cut your working yarn. Attach your yarn in the front of your work with the first unworked stitch from the main heart body. Chain one and single crochet across the nine stitches you didn't work for the right top -- this is the beginning of the left top. Chain one and turn. Single crochet two together over the first two stitches. Single crochet across the row, then single crochet two together over the last two stitches. Repeat this until you have three stitches remaining on the left side of the heart top, fasten off with a slip stitch and cut the fabric yarn. Attach your fabric yarn to the side of the heart. Single crochet evenly around the entire perimeter of the heart, then fasten off and cut your fabric yarn. Weave in your end on the back of your rug using your crochet hook to guide the tail through the stitches. Jessica Cook has been writing since high school when she wrote for TeenGrrl.com and GirlZone.com. During college she wrote for her university's e-zine, department newsletter and an education journal. She holds a Bachelor of Arts in English from Ohio Northern University, a Master of Arts in Teaching from Grand Canyon University and an Educational Specialist's degree in curriculum and instruction from Liberty University.